Pictured here are a few pieces I designed for the Independent Investigations Group Northwest. First up is a flyer I designed. 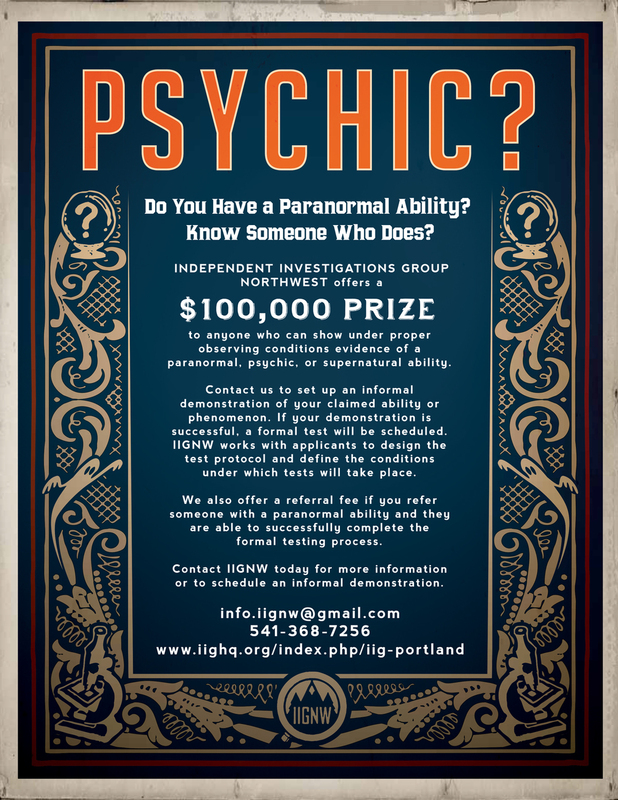 As you might gather from the copy, the group is interested in bringing someone in with alleged psychic abilities and testing them in laboratory conditions using mutually agree upon protocols. Neat stuff. Given the subject matter, I decided to use the back of zener cards for inspiration. I made simple letter-sized versions and 11x17 version with QR codes at the bottom. For the record, QR codes kill kittens. I read it in a book, so it must be true. I also kicked out an interactive PDF from InDesign. Previously, the group used xeroxed forms that had to be filled out by hand. Now, they can simply type in and click the corresponding buttons to complete and send the document. I also designed the logo concepts and final logo for the group. They ultimately chose something close to the mocked-up piece they originally sent... but at least the mountains fit in the magnifying glass, and the lockup can be laid out a few different ways depending on where it's being used.